Add whole milk, heavy cream, and salt to a pot. Bring to a simmer over medium-high heat, whisking constantly. Stir until the mixture reaches 85°C/185°F, approx. 5 min.. Mix lemon juice and distilled white vinegar, then add to milk and cream mixture in the pot. Bring to a simmer again. Continue stirring until the whey and curds separate. Remove from heat and let sit for approx. 5 min., without stirring. 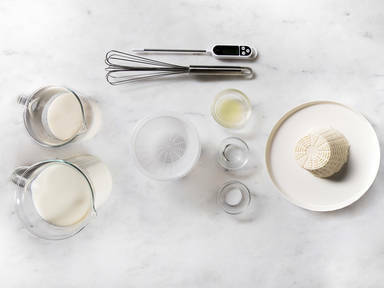 Use a slotted spoon to place the curds into a cheese maker or cheese cloth. Let cool in cheese maker for 10 min. more. Refrigerate and let drain for approx. 1 hr.. The ricotta can be stored in the refrigerator in an airtight container for up to a week.